In psoriatic arthritis (PsA), a complex disease with a lack of measurable laboratory parameters, there is a need for diagnostic and prognostic tools to meet the challenge of early diagnosis and assessment of disease severity. To analyze whether soluble biomarkers could discriminate between disease phenotypes in PsA. Two-hundred and seventy-four patients with established disease and 30 healthy controls were included in this cross-sectional study. Thirty-nine different serological biomarkers were investigated in relation to disease activity, disease manifestations and in comparison with controls. In addition to standard statistical methods, orthogonal partial least squares discriminant analysis (OPLS-DA) was used to investigate different phenotypes of PsA. Psoriatic arthritis activity was significantly associated with CRP (pc = 0.0008), IL-6 (pc = 0.001), IL-16 (pc = 0.007), calprotectin (pc = 0.014), IL-12/IL-23p40	(pc = 0.02), and ICAM-1 (pc = 0.045). Different PsA disease phenotypes were associated with different biomarkers, e.g., axial disease (with or without peripheral disease) was associated with IL-6 (pc = 0.044), IL-16 (pc = 0.044), MIP-1β (pc = 0.039) and polyarthritis was associated with IL-6 (pc = 0.0006), SAA (pc = 0.009), CRP (pc = 0.012) and IL-8 (pc = 0.04), although it was not possible to statistically separate the different phenotypes with OPLS-DA. An association was also seen in patients with PsA who, at any time had been prescribed bDMARD, (TNFβ (pc = 0.0001), TNFα (pc = 0.0003), calprotectin (pc = 0.0009), CRP (pc = 0.016) and lower levels of Tie-2 (pc = 0.027)). No significant differences were detected when PsA patients were compared with healthy controls. 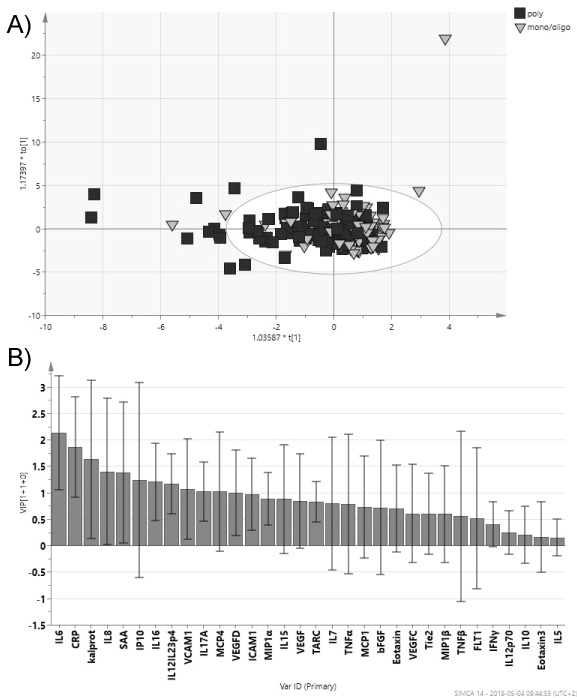 In this study, inflammatory/pro-inflammatory biomarkers were associated with different disease phenotypes in PsA, however the impact of the various biomarkers is not evident as OPLS-DA analyses could not separate between groups. Psoriatic Arthritis (PsA) is a heterogeneous inflammatory arthritis associated with psoriasis. The disease leads to inflammation of synovial tissue and can result in severe destruction of affected joints leading to disability and impact on quality of life. In the sub-population of patients with PsA, that present with symmetric polyarthritis, it can be difficult to discriminate PsA from Rheumatoid arthritis (RA) . In contrast with RA, most individuals with PsA are sero-negative for rheumatoid factor (RF) and/or anti-citrullinated protein/peptide antibodies (ACPA) [2,3]. Traditional markers of systemic inflammation, such as ESR and/or CRP are elevated in only 50% of the individuals with PsA [1,4], whilst manifestations in the joints of the axial skeleton, distal interphalangeal (DIP) joints, dactylitis and enthesitis are common . To date no serological markers for PsA disease, or disease activity/severity, have been presented making it difficult in the early stages of disease, to predict severity of disease and disease progression. Both genetic and environmental factors are considered important for disease development . Thus, biomarkers, both as a diagnostic aid, and predictor of disease activity/severity, would be of high value. A large number of biomarkers have in previous studies been proposed to be markers of PsA, but to date none of them have reached clinical practice [6,7]. Furthermore, as yet the relevance of several biomarkers are indicated but so far, studies are few and often include a few PsA cases, therefore, further investigations in the area is important [8-16]. 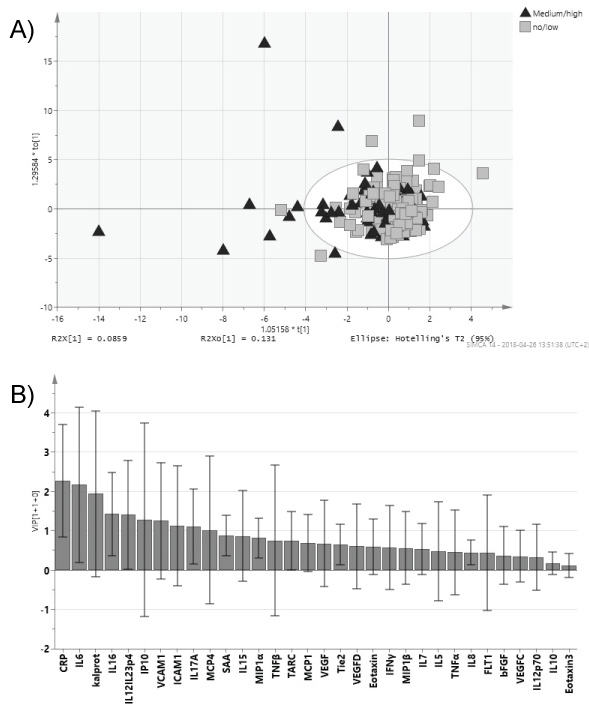 Considering the heterogeneity of PsA disease, and the lack of any easy diagnostic tools, we wanted to analyze serological biomarkers in the sera from well-characterized individuals with PsA. Furthermore, we wanted to explore whether any of the selected biomarkers could discriminate between clinically active disease or different disease phenotypes among patients with PsA. In the study, 274 patients with PsA and 30 healthy controls from the county of Västerbotten, Sweden, were included. The diagnosis of PsA was established by rheumatologists at the department of Rheumatology, University Hospital, Umeå. Between 1995 and 2015, blood samples were collected in conjunction with clinical investigation. The diagnoses were confirmed and medical records evaluated through standardized protocols by the authors (KJ and GMA). The study was approved by the Regional Research Ethics Committee of Umeå University. All participants gave their informed consent. Patients' medical records were investigated in order to verify the diagnosis and define different disease phenotypes of PsA. Patients were diagnosed according to both CASPAR-  and Moll and Wright criteria . PsA disease activity, considering axial-and peripheral joint involvements, enthesitis, dactylitis and laboratory activity, was evaluated at the time of collection of blood according to the investigating clinician as none, low, moderate, high or maximal. Also, the number of arthritic joints and dactylitis was recorded. Sub-categorization was made according to either peripheral disease only, axial disease only, a combination of axial and peripheral disease or spondyloarthritis (SpA) (enthesitis and neither axial nor peripheral arthritis). Axial involvement of PsA disease was defined based on radiological findings in the sacroiliac joints (SI-joints) according to the New York criteria (≥ 2) and/or syndesmophytes, ligamentous ossification, vertebral squaring and shining corners of the spine and/or positive MR-findings of the SI-joints or spine . Psoriatic skin disease was either diagnosed by a dermatologist or a rheumatologist, as was psoriatic nail disease (pitting or onycholysis). Polyarthritic disease was defined if an individual with PsA and with active disease presented with ≥ 5 swollen and tender joints. Destructive/deforming disease was defined as either typical, radiological changes (e.g. erosions, juxta-articular new bone formation) and/or irreversible deformations (e.g. ankylosis, subluxations, and/or loss of function or reduced mobility) on clinical examination. Measurable inflammation when clinically active PsA disease was defined as either elevated levels of CRP (≥ 10 mg/L) and/or ESR (≥ 20 mm/h) when clinically active PsA disease, according to the investigating clinician. The medical treatment, conventional synthetic DMARDs (csDMARDs) (cyclosporine, hydroxychlorokine, leflunomide, methotrexate, myocrisin or sulfasalazine), biologic DMARDs (bDMARDs) (abatacept, adalimumab, certolizumab, etanercept, golimumab, infliximab or ustekinumab) was recorded upon investigating patients medical record as either never, current or intermittent/previous. Demographic data is presented in Table 1. Serum samples were collected in conjunction with clinical examination, stored in aliquots in -80 ℃ and analysed using V-plex, 40-plex panel (Meso Scale Discovery (MSD), Meso Scale Diagnostic, LCC, Rockville, USA) according to the manufacturer's instructions. The biomarkers were primly selected based on the hypotheses of PsA as an inflammatory disease, despite the lack of known inflammatory laboratory markers, and vascular involvement in PsA disease progress as part of inflammation as well as chemokines involved in the inflammatory process . The biomarkers included in V-plex, 40-plex are listed in Table 2. IL-18 and calprotectin was analysed with ELISA (Invitrogen™ IL-18 Human Platinum ELISA kit, Thermo Fisher Scientific, Bender MedSystems GmbH, Vienna, Austria and IDK®Calprotectin Serum/Plasma ELISA, Immundiagnostik AG, Bensheim, Germany) according to the manufacturer's instructions. The V-plex 40-plex panel was selected based on the analysis being validated and the wide variety of biomarkers included, e.g. in inflammation, angiogenesis and vascular injury. S-calprotectin has previously been suggested as a marker for disease activity in PsA . In another study we have investigated genetic polymorphisms related to the inflammasome and we therefore wanted to investigate IL-18 for its known relation to inflammasome activation. For some biomarkers (IL-18, GM-CSF, IL-13, IL-1α, IL-1β, IL-2 and IL-4), most samples were below detection limit of the assay, both in patients and controls, and the majority of samples with measurable concentrations, were just above detection limit, consequently these biomarkers were excluded from further analysis. To discriminate between the impact of disease phenotypes among patients with PsA and, to check for a possible difference between PsA and controls, orthogonal partial least squares discriminant analysis (OPLS-DA) was performed using SIMCA-P+ (version 12.0; Umetrics AB, Umea, Sweden). OPLS is a modification of partial least squares method that has been used in chemometrics analysis, with similar capacity as the original, but improved model interpretation [18,19]. Student's t-tests were analyzed using Microsoft Excel 2016 and p-values were adjusted by multiple test correction (pc) according to Benjamini-Hochberg. Mann-Whitney U tests were analyzed by SPSS 24.0. For all analysis p-values were two-sided and a significance level of ≤ 0.05 was considered significant. Patients with a moderate to high disease activity according to the investigation clinician had significantly higher levels of CRP (pc = 0.0008), IL-6 (pc = 0.001), IL-16 (pc = 0.007) calprotectin (pc = 0.014), IL-12/IL-23p40 (pc = 0.02) and ICAM-1 (pc = 0.045) compared with patients with none or low disease activity (Figure 1 and Table 3). Figure 1: PsA patients with ≥ moderate disease activity compared with ≤ low disease activity at clinical examination and collection of blood. Sixteen individuals had active dactylitis at investigation. There was no significant difference between patients with or without dactylitis (data not shown). When stratifying the patients according to the presence of axial disease, with or without concomitant peripheral joint disease, higher levels of IL-6 (pc = 0.044), IL-16 (pc = 0.044) and MIP-1β (pc = 0.039) were present in those with axial disease (Table 3). When patients with only axial involvement of disease were compared with peripheral disease only, or with a disease pattern with both axial and peripheral involvement, no significant differences were detected (data not shown). Patients with a polyarthritic disease pattern had significantly higher levels of IL-6 (pc = 0.0006), SAA (pc = 0.009), CRP (pc = 0.012) and IL-8 (pc = 0.04) in comparison with patients vid mono-/oligo arthritic disease pattern (Figure 2 and Table 3). Figure 2: PsA patients with mono-/oligoarthritis compared polyarthritis. A disease pattern with measurable inflammation when clinically active PsA diseases was associated with elevated serum levels of CRP (pc = 0.0001), but also SAA (pc = 0.003), IL-6 (pc = 0.003), VCAM-1 (pc = 0.017), calprotectin (pc = 0.020), IL-17A (pc = 0.022), TNFβ (pc = 0.022), IL-16 (0.025) andIL-12/IL-23p40 (pc = 0.040) (Table 3). No significant association were found between destructive/deforming disease pattern and any of the analysed biomarkers compared with non-destructive/deforming disease (data not shown). In patients who, at any time during disease course had been treated with bDMARD (n = 42) an association with higher levels of TNF-β (pc = 0.0001), TNF-α (pc = 0.0003), calprotectin (pc = 0.0009), CRP (pc = 0.016) and lower levels of Tie-2 (pc = 0.027) (Table 3). Of the 42 individuals, 9 was treated with bDMARD when blood samples were collected, 6 had previously been prescribed bDMARD and 27 received bDMARD after blood sampling and no significant differences between these three groups were detected concerning the levels of the biomarkers (data not shown). Treatment with csDMARD (past or present) did not show any relationship with any of the analysed serological biomarkers (data not shown). In single analyses of the biomarkers there were several biomarkers that were significantly different when comparing disease characteristics or phenotypes (Table 3). Anyhow, when using OPLS-DA it was not possible to separate between patients with high/moderate disease activity compared to no/low activity (Figure 1), polyarthritic or mono/oligoarthritic phenotypes (Figure 2), or any of the disease characteristics described in Table 1. Anyhow, a trend was seen toward separation of the groups. Using OPLS-DA it was not possible to separate PsA from controls (Supplementary Figure 1). By stratifying PsA patients into sub-groups, significant associations were discovered when analyzing single biomarkers that could differentiate patients with clinically active PsA disease defined by the clinicians' assessment at the time points of serum sampling, and also separate different clinical phenotype, e.g. peripheral vs. axial disease and mono-/oligo arthritis vs. polyarthritis. As shown in Figure 1 and Figure 2 no complete separation between disease phenotypes was visual, but a trend was obvious and our results revealed interesting associations that both agree with and differ from previous findings [9,11,13]. The study design in which both clinically active and inactive patients were included and with patients examined at the same time point as serological samples were collected, enabled comparison between PsA patients with and without clinically active disease. The findings of associations with IL-6, CRP, IL-16, calprotectin, IL-12/IL-23p40 and ICAM with patients with moderate to high disease activity indicate a link between these inflammatory biomarkers and PsA disease activity. In a previous Norwegian study , 23 soluble cytokines were investigated in 43 patients with polyarthritic PsA phenotype and 25 healthy controls. With the exception of G-CSF, EGF and IFNα, all of these were also analyzed in our study. In their study significantly increased serum levels of INF-α, IL-10, IL-13, CCL3 (MIP-1α), CCL4 (MIP-1β), CCL11 (Eotaxin), EGF, VEGF and FGF were detected in individuals with PsA whereas the G-CSF levels were decreased. As in our study, patients were divided according to disease activity (in the Norwegian study defined by the number of swollen joints at investigation, 0, 1-3 and ≥ 4) and levels of IFNα, IL-15 and IL-2 were able to discriminate between the three groups . Their result differs from our results as no associations with EGF, VEGF and MIP-1α and PsA were found in our study, although both our and their study was in agreement concerning association with IL-12p40. The difference between studies could be due to differences in study design, e.g. in their study patients with a polyarthritic disease pattern were selected, and a different statistical method was used. Consequently, direct comparison between the studies is difficult. Few studies have examined serological biomarkers in different disease phenotypes of PsA. In a study by Przepiera-Bedzak, different extra-articular manifestations of Spondyloarthritis (uveitis, inflammatory bowel disease, psoriasis, pustulosis palmo-plantaris, and onycholysis) were associated with increased IL-18 concentration and decreased Endothelin-1 concentration . In our study, we found associations with axial involvement of disease (with or without concomitant peripheral involvement) and the levels of IL-6, IL-16 and MIP-1β. Interestingly, the lack of significant differences between peripheral disease only and axial disease only indicated that it is not the axial disease per se that causes the difference and it is possible that the combination of both axial and peripheral disease reflects a more aggressive disease phenotype. We also found association with polyarthritic disease phenotype and higher levels of IL-6, SAA, CRP and IL-8. 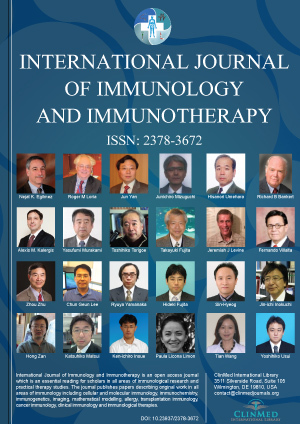 The association with IL-6 is in agreement with a previous study , SAA and CRP likely reflects a higher inflammatory reaction in this subgroup. Elevated serum levels of IL-8 have not previously been found associated with PsA, but elevated levels in synovial fluid were reported to be associated with PsA disease activity . Obvious from our results is that inflammatory markers, e.g. CRP, SAA, calprotectin, IL-6 and IL-12/IL-23p40, discriminate between different PsA disease phenotypes, e.g. polyarthritic compared with mono-oligoarthritic phenotypes and axial and/or peripheral compared with peripheral disease only, both likely reflecting an increased inflammatory burden of disease. In conclusion, in this study on well-characterized patients with PsA, interesting associations with clinical disease phenotypes of PsA and biomarkers were detected. The study highlights the heterogeneity of PsA disease, with different biomarkers associated with different disease. The higher serum levels of TNFα and TNFβ in patients who, at any time, had been prescribed biologic treatment (in the majority of cases TNFα-inhibitors) is interesting. The prescription of this treatment is likely to reflect a more aggressive disease phenotype. In most cases serum samples had been collected before the start of bDMARD (n = 27, 69%). Only nine individuals were currently receiving bDMARD when blood samples were collected. Unfortunately, due to study design, the relation with the last dose was unknown and, therefore there is a possibility that the levels of TNFα were affected by the treatment. However, since TNFα inhibitors most likely, would decrease the concentration of TNFα, the significant difference would not be reduced. Thus, the higher levels of TNFα and TNFβ could reflect a PsA disease phenotype with higher clinical activity and need for more aggressive treatment. To investigate this association further, a prospective study is suggested. Ongoing dactylitis is a marker of a severe disease phenotype but, in our study, there were not many patients with active dactylitis at clinical examination and, there were no significant associations with any of the biomarkers. We did not find evidence for associations with angiovascular biomarkers except for a marginal association for the adhesion molecules ICAM and VCAM. This could indicate some vessel damage but the overall results do not give enough support for the hypothesis. The strength of this study is the relatively large study population with well-characterized patients with PsA. The size of the study and study design made it possible to sub-categorize the patients according to disease characteristics and phenotypes. The cross-sectional nature of the study has its limits since patients were included and blood samples collected at a time point without considering disease duration or whether PsA disease as active or inactive. Instead, the study design enabled PsA-patients to be stratified into sub-groups and compared with respect to disease activity at the time of investigation and collection of blood samples. Another limitation is that, unfortunately, the data in the medical records were insufficient to allow the use of any of the standardized activity indexes for PsA, e.g. DAS-28, disease activity index for psoriatic arthritis (DAPSA), minimal disease activity (MDA) or Psoriatic Arthritis Disease Activity Score (PASDAS). Disease activity was instead defined according to the investigating clinician. Since the blood samples were collected over a relatively long time period, long term storage could be an error source. However, none of the investigated biomarkers showed lower levels in the samples collected in 1995-2000 compared with 2015. In addition, patients and controls were not evaluated or excluded due to any concomitant disease/comorbidity and it cannot be excluded that such conditions could affect the levels of the biomarkers. Healthy controls were included as a control population for the analyzes of the biomarkers and when comparing with the study population, the populations corresponded well, indicating no difference although the number of controls were few. In this study, we found inflammatory and pro-inflammatory biomarkers associated with different disease characteristics and phenotypes in PsA and the study highlights the heterogeneity of PsA, with different biomarkers being associated with different phenotypes. Anyhow, the impact of the biomarkers in PsA still remains unclear since the OPLS-DA analyses did not discriminate between the groups. The results did not support vascular involvement - at least measurable with angiovascular biomarkers. The authors thank Kristina Eriksson, Maria Lindberg and Viktoria von Zweigbergk for technical assistance and the support by NBIS (National Bioinformatics Infrastructure Sweden), PhD Joakim Bygdell, in performing the OPLS-DA and t-test analysis is gratefully acknowledged. The work was funded with grants from Psoriasisförbundet (The Swedish organization against Psoriasis) and Västerbotten County Council, Sweden. KJ, the main investigator, designed the investigation together with GMA, investigated patients' medical records and participated, together with GMA in clinical investigation of PsA patients. KJ was also responsible for drafting of the manuscript, which was critically evaluated by GMA and SRD. GMA is the principal investigator, who, together with SRD is responsible for the samples from the Biobank and critical evaluation of the manuscript. Coates LC, Helliwell PS (2017) Psoriatic arthritis: State of the art review. Clin Med (Lond) 17: 65-70. Alenius GM, Berglin E, Rantapaa Dahlqvist S (2006) Antibodies against cyclic citrullinated peptide (CCP) in psoriatic patients with or without joint inflammation. Ann Rheum Dis 65: 398-400. Taylor W, Gladman D, Helliwell P, Marchesoni A, Mease P, et al. (2006) Classification criteria for psoriatic arthritis: Development of new criteria from a large international study. Arthritis Rheum 54: 2665-2673. Mease PJ (2011) Inflammatory musculoskeletal disease: Identification and assessment. J Rheumatol 38: 557-561. Moll JM, Wright V (1973) Psoriatic arthritis. Semin Arthritis Rheum 3: 55-78. 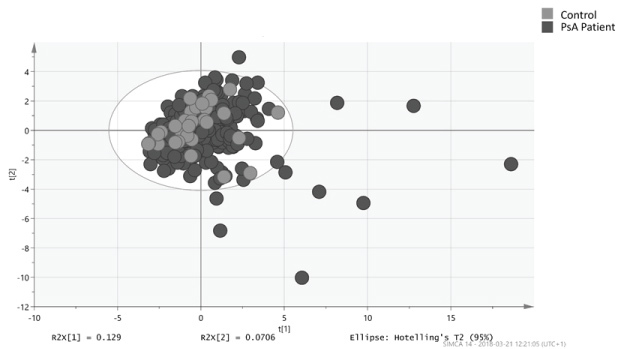 Villanova F, Di Meglio P, Nestle FO (2013) Biomarkers in psoriasis and psoriatic arthritis. Ann Rheum Dis 72: 104-110. Generali E, Scire CA, Favalli EG, Selmi C (2016) Biomarkers in psoriatic arthritis: A systematic literature review. Expert Rev Clin Immunol 12: 651-660. Hansson C, Eriksson C, Alenius GM (2014) S-calprotectin (S100A8/S100A9): A potential marker of inflammation in patients with psoriatic arthritis. J Immunol Res. Szodoray P, Alex P, Chappell-Woodward CM, Madland TM, Knowlton N, et al. (2007) Circulating cytokines in Norwegian patients with psoriatic arthritis determined by a multiplex cytokine array system. Rheumatology (Oxford) 46: 417-425. Madland TM, Larsen A, Brun JG (2007) S100 proteins calprotectin and S100A12 are related to radiographic changes rather than disease activity in psoriatic arthritis with low disease activity. J Rheumatol 34: 2089-2092. Przepiera-Bedzak H, Fischer K, Brzosko M (2016) Extra-Articular Symptoms in Constellation with Selected Serum Cytokines and Disease Activity in Spondyloarthritis. Mediators Inflamm. Przepiera-Bedzak H, Fischer K, Brzosko M (2016) Serum Interleukin-18, Fetuin-A, Soluble Intercellular Adhesion Molecule-1, and Endothelin-1 in Ankylosing Spondylitis, Psoriatic Arthritis, and SAPHO Syndrome. Int J Mol Sci 17. Alenius GM, Eriksson C, Rantapaa Dahlqvist S (2009) Interleukin-6 and soluble interleukin-2 receptor alpha-markers of inflammation in patients with psoriatic arthritis? Clin Exp Rheumatol 27: 120-123. Abji F, Pollock RA, Liang K, Chandran V, Gladman DD (2016) Brief Report: CXCL10 Is a Possible Biomarker for the Development of Psoriatic Arthritis Among Patients With Psoriasis. Arthritis Rheumatol 68: 2911-2916. Chandran V, Cook RJ, Edwin J, Shen H, Pellett FJ, et al. (2010) Soluble biomarkers differentiate patients with psoriatic arthritis from those with psoriasis without arthritis. Rheumatology (Oxford) 49: 1399-1405. Fitzgerald O, Chandran V (2012) Update on biomarkers in psoriatic arthritis: A report from the GRAPPA 2010 annual meeting. J Rheumatol 39: 427-430. Rudwaleit M, Van der Heijde D, Landewe R, Listing J, Akkoc N, et al. (2009) The development of Assessment of SpondyloArthritis international Society classification criteria for axial spondyloarthritis (part II): Validation and final selection. Ann Rheum Dis 68: 777-783. Eriksson L, Rosen J, Johansson E, Trygg J (2012) Orthogonal PLS (OPLS) Modeling for Improved Analysis and Interpretation in Drug Design. Mol Inform 31: 414-419. Trygg J, Wold S (2002) Orthogonal projections to latent structures (O-PLS). J Chemometr 16: 119-128. Kristina Juneblad, Department of Public Health and Clinical Medicine, Rheumatology, University Hospital, 90185 Umeå, Sweden, Tel: +46907850000, Fax: 4690131567. © 2018 Juneblad K, et al. This is an open-access article distributed under the terms of the Creative Commons Attribution License, which permits unrestricted use, distribution, and reproduction in any medium, provided the original author and source are credited.